Wolfgang Deep Gloss Paint Sealant 3.0 redefines the paint sealant. Wolfgang Deep Gloss Paint Sealant 3.0 will alter your perceptions of paint sealants forever. The glossy, liquid-like shimmer enhances all types and colors of paint. No other synthetic wax or paint sealant gives your vehicle the gloss, the depth, and the protection of Wolfgang Deep Gloss Paint Sealant 3.0. Now with fortified polymer technology, Wolfgang Deep Gloss Paint Sealant 3.0 is simply the best paint sealant you�ll ever use. that captures the wet look of a carnauba wax but lasts longer. were the foundation of our original groundbreaking formula. With Wolfgang Deep Gloss Paint Sealant 3.0, we�ve taken our signature paint sealant to a whole new level. With the addition of a new breed of polymers, Wolfgang Deep Gloss Paint Sealant 3.0 offers more protection, gloss, and depth than ever before. We�ve absorbed the cost of implementing this new technology so Wolfgang Deep Gloss Paint Sealant 3.0 can remain an excellent value at the same price as the original formula. Wolfgang Deep Gloss Paint Sealant 3.0 features fortified polymer technology. Wolfgang�s German Super Polymers are fortified with more dirt-repelling power to keep your vehicle cleaner and shinier, longer. Our enhanced super polymers have an amazing anti-static property that repels water, oil, dust, and road grime to provide unsurpassed paint protection. Your vehicle stays cleaner because foreign molecules literally slide off the clear polymer coating. Super polymers bond easily to automotive paint and form an extensive cross-linked polymer network. This clear shield eliminates surface tension so contaminants have no foothold on your vehicle. The network of slick super polymers increases the paint�s �jetting factor�. Jetting factor is another word for decreased surface tension. No other paint sealant matches Wolfgang�s jetting factor. Regular washing with Wolfgang Auto Bathe will allow dirt to slide right off the paint. The look of Wolfgang Deep Gloss Paint Sealant 3.0 is similar to the shine of a carnauba wax but with a slicker, wetter surface gloss. The paint looks like a clear glossy coating was just poured over it. The paint ripples with reflections and light bounces off every angle and curve. The crystal-like structure of the German Super Polymers yields an incredible, vivid shine - not a sterile, surface shine. The crystals refract light much like high-quality diamonds. Any color is enhanced by Wolfgang Deep Gloss Paint Sealant 3.0. Wolfgang Deep Gloss Paint Sealant 3.0 replicates the best qualities of carnauba wax � slickness and shine � but it has more than double the longevity of the average carnauba wax. Just a few drops will produce a show-stealing shine that withstands the elements, ultraviolet rays, infrared radiation, salt water, and environmental pollutants and armors your paint for months. Plus, Wolfgang Deep Gloss Paint Sealant 3.0 is an excellent value. A little goes a long way. Wolfgang Deep Gloss Paint Sealant 3.0 was created to meet any car care challenge. It stands up to extreme temperatures, road salt, salty ocean air, ozone, and moisture. Apply it in hot, humid conditions � Wolfgang Deep Gloss Paint Sealant 3.0 will deliver a streak-free shine every time. Apply it just before the onset of winter and your vehicle will be protected until spring! 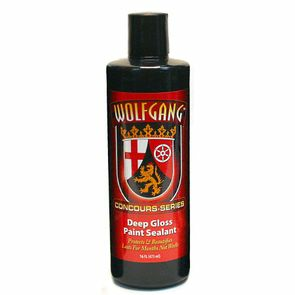 Tech Note: Wolfgang Deep Gloss Paint Sealant 3.0 is a water-based, oxygen activated paint sealant. After buffing off the sealant, the remaining coating needs to cure for 12 hours in dry conditions to fully bond to the paint. Exposure to moisture during this time will drown the polymers. For the best results, allow 12 hours of curing time. Wolfgang Deep Gloss Paint Sealant 3.0 redefines the paint sealant in words any car lover can appreciate: dripping wet gloss, slickness, and incredible reflections. Take your vehicle to the next level of paint protection. Use Wolfgang F�zion Estate Wax to create crisp, mirror-sharp reflections. Apply Wolfgang Deep Gloss Paint Sealant 3.0 over the entire vehicle either by hand or with a machine. wait 30-45 minutes before buffing. Wash your vehicle using Wolfgang Auto Bathe or your favorite shampoo. Dry completely. 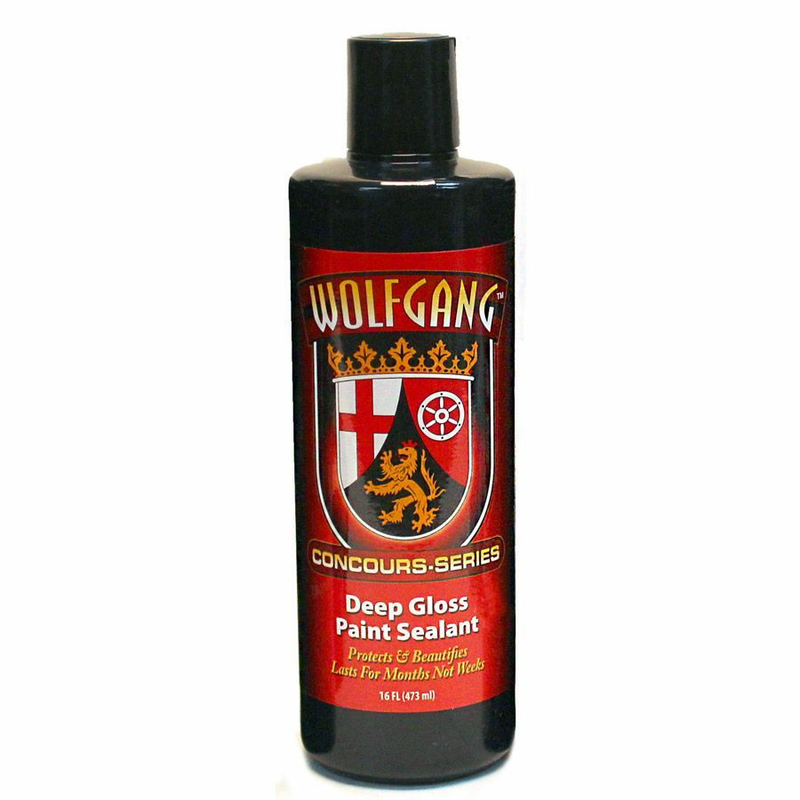 For the best results, use a paint cleanser like Wolfgang Paintwork Polish Enhancer to remove mild imperfections and wax build-up. Apply Wolfgang Deep Gloss Paint Sealant 3.0 over the entire vehicle either by hand or with a machine. If applying by hand, use a yellow foam applicator. If applying by machine, use a blue finessing pad. Using a dual action polisher, set the maximum speed to 4.5 and work in overlapping sections until the entire vehicle is covered. Apply a very thin, even coat. Once the vehicle is covered, wait 30-45 minutes before buffing. Use a microfiber towel or a microfiber bonnet on your polisher. This product is moisture-sensitive. In order to achieve a slick, durable finish, Wolfgang Deep Gloss Paint Sealant 3.0 must cure for at least 12 hours before being exposed to moisture. Do not apply sealant before dusk because dew will interfere with the adhesion to the paint. Park your vehicle in a garage or under a shelter while it is curing, if possible. Use Wolfgang Deep Gloss Spritz Sealant to boost the gloss and protection any time with even more reflective Super Polymers. * If you like the layered look, first lay down a coat of Wolfgang Deep Gloss Paint Sealant 3.0. After it cures, apply a coat of Wolfgang F�zion Estate Wax to enjoy the benefits of both carnauba wax and polymers. Firstly, I am 76 yrs old, and "easy to use" probably doesn't mean quite as much to you as it does to me. But it is. Quick, Minimal elbow grease. The drying time thing is kinda a pain, since my garage is enclosed, but I schedule around it. I have to say that the finish is slick and I get close to 4 months durability on a garaged daily driver in Southwestern PA. I am very satisfied with the results. I purchased it knowing it needed a 12 hour cure, but I was surprised how often it impacted when I was able to detail the car. Highly recommended when it is on sale and you can work around the 12 hour cure. After I finish using the current bottle, I will be trying another product that won't require the 12 hour cure. I understand that I may not get the same results, but if I can get to 90-95% of the Wolfgang results, I willing to make the trade-off. Been very happy with this paint sealer. It is easy to apply and remove. Water still beads and is smooth to the touch after 3 months. Liked it so much I bought more before I ran out. ProsEasy to use and long lasting. This sealant goes on easily and wipes away with almost no effort. The results are very good - high gloss and a surface that feels like melted butter. I asked for a product that was easy on/off, and durable. This is definitely the easiest sealant I've ever used. Applied a month ago, it still beads like it was freshly applied. It claims to last a year, but I won't expect that. I'll be more than happy if another application in November gets me through a PA winter. This sealant is famous for good reason. It gives a deep, wet shine, it's durable (I get 6 months), it creates amazing small beads on the car's paint, it's a breeze to put on and buff off. Cons12 hour cure time before moisture, but that's ok for me. This product if applied as instructed or even from the forums will last an amazingly long time and also keep the paint protected and GLOSSY. The depth that this adds and even after being layered is amazing. I used to use other brand names for sealants but I switched to this and won't look back. ProsAll aspects of this product. Easy to apply and remove. Great protection. I hope it lasts many months. I'm on my second bottle of Wolfgang Sealant and I'm always amazed at the results. I recently purchased Wolfgang Fion Estate Wax and applied it over the Wolfgang Sealant and all I have to say is wow! I seriously have not tried anything better, from the ease of application, removal, and results that last a decent amount of time! I definitely had this last through one full winter in the northeast, and I'd say the durability claims are on par. In good weather i've had it last about 5 months before I decided to reapply since i got bored of just doing a quick wash on my vehicle. and the beading.. just tight and beautiful!!! Conscost? but you get what you pay for coatings can out do this sealant but also much more expensive. This is a WOW sealant, just WOW!!! Look at the car the next day and dropped my jaw. One of the best sealants out there. Adds depth to color- some say like adding another coat of clear, Easily lasted a midwest winter. Cons12 hour cure time without getting wet. I don't like that I have to time it with the weather when I put this on my outside vehicle. I love the shine and clarity of this product. It feels very smooth and slick to the touch and has amazing beading capability. It usually lasts several months and offers great protection to your paint as well as good looks. It is a little on the expensive side but it works. This is my third bottle of Wolfgang Deep Gloss Paint Sealant I have bought. It goes on and wipes off easily and gives my car a nice silky protection. I would highly recommend this product to anyone. My children use it too on their cars and love it too. Try lots of products in all categories. This is unique, it works better that ANYTHING else I have. I dont even want to put Wax on top, it shines so deep. They really mean it when they say Deep Gloss! A little of this stuff goes a long way! Super easy to apply by hand or DA. Just apply then by the time you've covered the whole car, it's ready to be buffed off. Just as easy to remove as it is to apply with almost zero dusting. Does some darkening to paint which I like -- I almost prefer the look of this to some waxes. Seems more glassy and really lets metallic flake pop. A little more expensive than other sealants, but I think it's ease application and general look are worth it! I use this and the Menzerna power lock. They both have a great gloss. Easy to apply by machine with a blue or red LC pad one speed 3-4. Easy to wipe off after it drys completely. Prepped the surface with a good wash and clay bar, then applied a very sparse coating of this sealant. Goes on very easy and comes off with an easy wipe. Both vehicles (one dark gray and the other dark blue) look very wet and the shine is deep. Can't wait to try a layer of the estate wax on top to really set it off. Best ever . . . I finally bought the Wolfgang, and first applied to my midnight blue metallic Boxster. I was amazed, shocked actually, on how good the color was when done. Liked it so much I applied a secong coat, which unfortunately darkened the color slightly. This product applies so easily, stains nothing, and leaves a feel to the car that has to be seen and felt to be realized. Applies easily, and comes off even easier. I have since used it on a crystal silver Cayenne and a 2003 Audi TT metallic grey. Superb experience with each application. ProsEase of application. Comes off even easier. Finish and feel. Deep Gloss Paint Sealant is an absolutely amazing product. Very easy to apply and remove, looks great on any color, great beading, good at helping repel dirt, soap rinses easily off it, etc. It really doesn't get a whole lot better than this. A little goes a long way, so you can do quite a few cars with one 16 oz. bottle. Well worth the cost of admission. Wonderful sealant. Very easy to use, provides months of durability, and looks sharp. I top this with Fuzion of a killer combo.